First line: "I lie all the time." This book was okay. I picked it up because I had love, love, loved Nick and Norah's Infinite Playlist written by the same authors. Naomi and Ely are best friends who have grown up across the hall from each other in a chic New York high-rise apartment building. The past year has been rocky for them, as Naomi's father destroyed their family with an illicit affair with one of Ely's lesbian moms. The aftermath is awkward all around for everyone in the building. 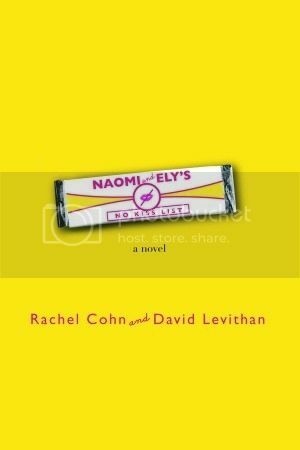 The main conflict, of course, is that Naomi still harbors a childhood crush on Ely - she's certain that they were destined for one another, and the fact that Ely has been openly and proudly gay for the last few years hasn't put a dent in her affections. Naomi and Ely are like a younger Will & Grace, full of witty banter and extremely close, and of course, totally co-dependent and wrong for each other. Levithan and Cohn absolutely nail the awkwardness of the late teen years - wanting desperately to seem cool and hip and often tragically failing. I liked how self-conciously arch and clever the characters were, even though there were several cringeworthy moments where they were trying too hard. The book has multiple viewpoint characters, each with a very unique voice. Unfortunately, a lot of the characters were unlikeable and unrelatable. Naomi has an extremely annoying habit of substituting symbols or smilies for words, making some of her chapters read like a rebus. Ely came across as bitchy and mean. Gabriel, the doorman with a crush on Naomi, made many musical references that I'm sure went over my head, and he seemed shallow, only liking Naomi for her looks. There were several different characters named Bruce, and several characters named Robin, which I'm sure happens in real life, but still made the story a bit confusing to follow at times. I couldn't relate to Naomi's pathetic romantic obsession with Ely, but I've known plenty of women who've fallen head over heels for gay guys and I've helped coach and counsel them through it. In my experience, this kind of thing usually happens when a girl is absolutely not ready for a real relationship, so lusting after someone unobtainable feels more "safe." Fans of Levithan and Cohn's other works should seek this one out. The writing duo were ahead of the trend for "New Adult" fiction - mature YA featuring college-age protagonists. The New York City setting is critical to the tone and feel of the book. This story couldn't happen anywhere else. I liked how the big city excitement and fast pace didn't stop the characters from feeling like they were in a small town where everyone knows everybody else's business. Who will I recommend this book to? Glee fans who are Rachel/Kurt 'shippers (yes, sadly, such a thing exists.) New Adult readers. Contemporary fiction readers who enjoy schadenfreude in reading about failed romances.